"I do believe . . . this is the most troublesome parish that ever was." Mr. and Mrs. Darcy are looking forward to a relaxing stay with dear friends when their carriage is hailed by a damsel-in-distress outside of the village of Highbury. Little do the Darcys realize that gypsies roam these woods, or that both their possessions and the woman are about to vanish into the night. The Matters at Mansfield (#4), The Deception at Lyme (#6), The Suspicion at Sanditon (#7). Readers often ask me how I come up with my titles. The answer: I sweat blood. All right, not literally (that would be creepy), but it certainly feels that way. I usually have a working title in mind, but the final title eludes me until somehow the right words come together and I smack myself on the head (again, not literally—that would hurt) and say, "Of course! Why didn't I think of that sooner?" The working title, incidentally, has often become a book's subtitle. I finished writing the book—still no title. As the deadline for my publisher's catalog loomed and the manuscript headed into production, my editor and I agonized. We needed something that fit in with the previous titles of the series and that clearly linked my book to Austen's Emma, yet without emphasizing Emma's name so much that readers might mistakenly think it was a Mr. & Mrs. Knightley mystery and wonder what happened to the Darcys. Hoping for something alliterative to echo the previous titles, I even went so far as to pore through the entire "H" and "E" sections of the Oxford English Dictionary in search of something that would work nicely with "Highbury" or "Emma." While I learned all sorts of interesting, obscure new words (new to me, anyway) alas, "Hugger-Mugger at Highbury" just did not seem to have the tone we sought! In the end, we sacrificed alliteration, and found a good synonym for "mysterious affair" with fewer letters. 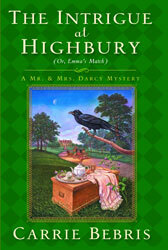 After all the distress and vexation, I am well pleased with The Intrigue at Highbury, and the subtitle, Emma's Match, is perfect on multiple levels: (1) The mystery Emma helps solve presents her with a challenge worthy of her intellect. (2) In Elizabeth Darcy, Emma finally has a friend who is her equal. (3) The object of Emma's latest matchmaking scheme (with Emma in the book, you knew there had to be a matchmaking subplot!) presents such a challenge that she has truly met her match. In finding a title, I certainly felt as if I had met mine!